Let me preface this by saying that I have never been a big Urban Meyer fan. I really don’t know why that was… and I say WAS because a couple of things happened this past week that made me feel more akin to Coach Meyer. The first was Coach Meyer’s response to a statement made last week by Tom Herman (OC under Meyer at Ohio State) not being able to “sprinkle fairy dust” on the Texas Longhorn team he inherited from Charlie Strong (DC under Meyer at Florida) following a loss in his debut against Florida. "C'mon man. I don't know where that came from," Meyer said during an interview with CBS sports "It's like a new generation of excuse. Herman said, 'I can't rub pixie dust on this thing.' He got a dose of reality. Maryland just scored 51 points on you." "[Blaming players] drives me insane." There was much back and forth banter on the TwitterSphere debating whether or not Coach Herman was just using “figurative language” or his comments were disparaging in regards to the previous UT staff. I know what I though the minute I heard the comment… exactly what Coach Meyer thought. 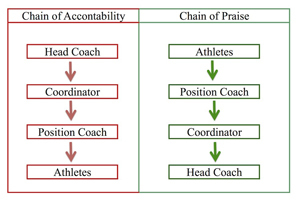 I have written about this before in this post… Chain of Accountability, Chain of Praise… about two different ways leaders can respond to adversity and success. While it does not “drive me insane,” it does make me cringe whenever I hear coaches (or leaders) blame players for losses. I think it shows lack of maturity … lack of leadership… it’s the easy way out. The second thing that came to light this week was Urban Meyer sharing how a “gift” he has is also a curse. Meyer talked about how his “gift” of being an obsessed, perfectionist, competitor led to his anxiety, sleep deprivation, and poor health... Something, I am sure, many reading this column can relate to… but more on that in a later post! And now a quick (but shameless) plug for my new project, the YouCanDoMore YouTube Channel … a resource for players, parents, and coaches to help better understand and navigate the collegiate recruiting process. This post – The YouCanDoMore YouTube Channel, has links to the most recent episode and a playlist of all the episodes currently uploaded. I hope you can take the time to watch and share this link to colleagues, players and parents. Your help is appreciated!